Wilmore bed and breakfast travel guide for romantic, historic and adventure b&b's. 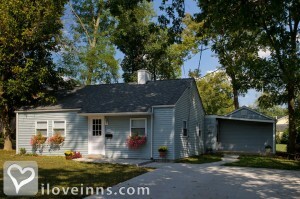 Browse through the iLoveInns.com database of Wilmore, Kentucky bed and breakfasts and country inns to find detailed listings that include room rates, special deals and area activities. You can click on the 'check rates and availability' button to contact the innkeeper. Wilmore, KY, home to Asbury University and Asbury Theological Seminary, rests in the heart of the Kentucky Bluegrass with nearby Rt. 68 designated a Kentucky Scenic Byway, offering beautiful views all seasons including fall foliage and rare wildflowers in spring. There's always something going on around town including the Arts and Crafts Festival in fall with local artisans or the Old Fashioned Musical Christmas Celebration complete with bands and choirs, carriage rides and townsfolk wearing old fashioned costumes. There are many historic homes and buildings from the Civil War period and the founding of Asbury University in 1890. Visit the Caboose Museum and the University grounds for more immersion in the town's vibrant history. By Scott Station Inn B&B.